2 Lt. Wayne Rabun was scheduled to be part of a formation of four F-84B aircraft for a radar calibration flight. Aircraft problems lead to a plane switch and by the time he got off the ground, he was too far behind schedule to participate with the other three ships. His flight leader advised him to put in some local flying time near the base. About an hour into the flight, Rabun spotted and joined up with a different three ship formation headed back toward Dow AFB. He was on a different radio channel, so he had no contact with them and did not know their intentions. The flight leader began a "rat race" as they neared the base and Rabun followed as the last ship. The leader did an immelman and the next two planes followed suit. Rabun thought they were doing a loop, so kept going over the top. The aircraft exceeded its limiting mach and the controls locked up due to compressability. In a high speed dive, the aircraft was overstressed and both wings broke off. 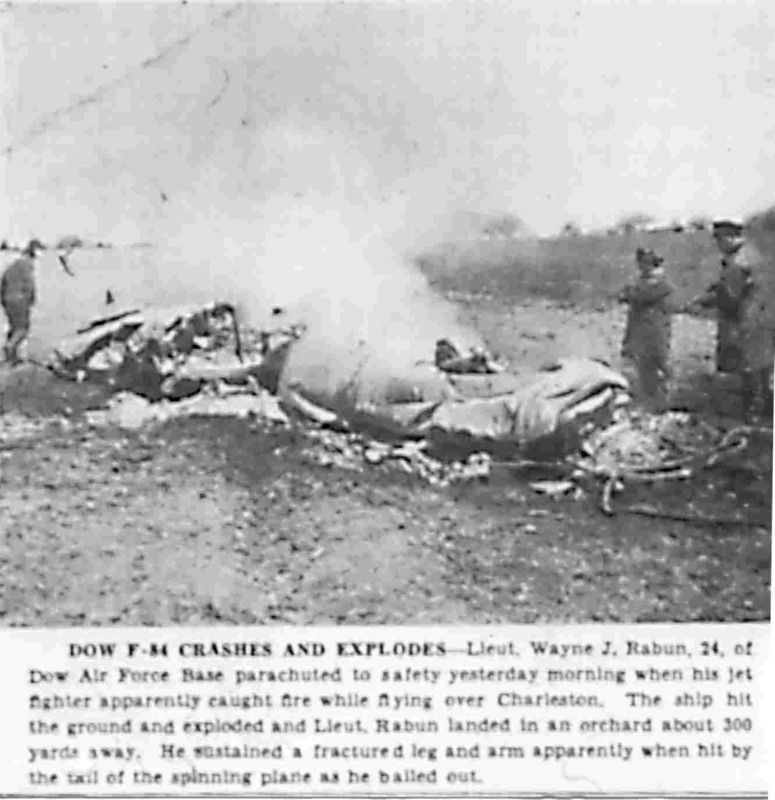 Due to problems experienced with the F-84 ejection system, planes were flying at this time with the seats disarmed. Rabun fought and eventually opened the canopy and bailed out. The tail struck him fracturing his arm. 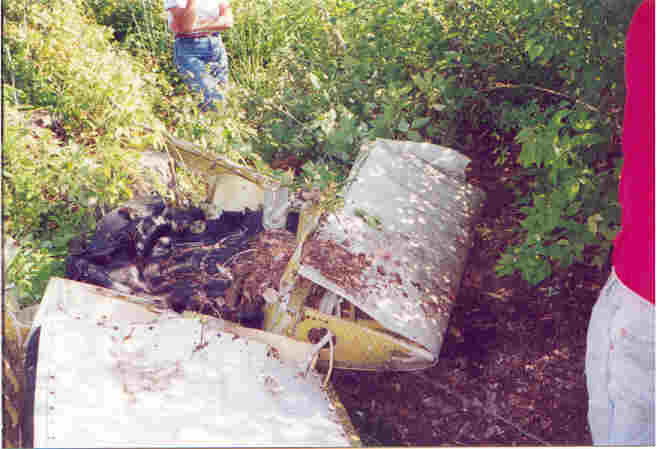 The aircraft fuselage crashed and burned in a farm pasture. Rabun landed safe but injured nearby. 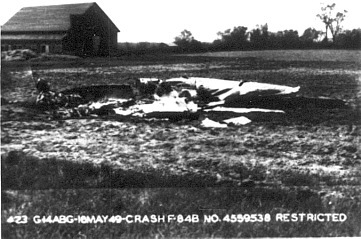 The wings were not located during the crash investigation. Lt. Rabun later died in Korea when his F-51 collided with an Army Forward Air Control aircraft on a bombing run. 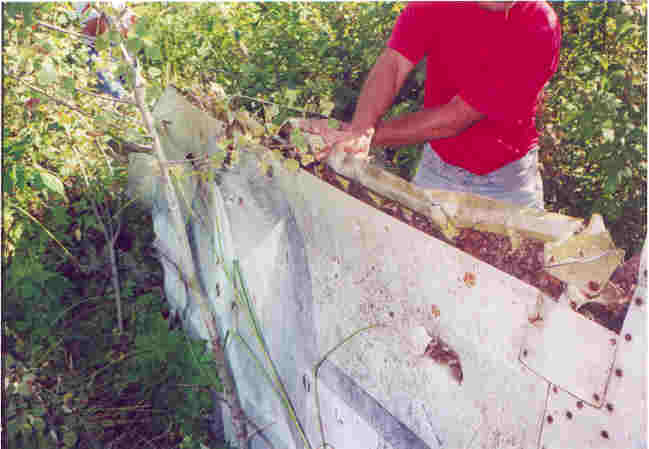 In the summer of 2000, I was contacted by a landowner, through Turkey's Unlimited, to identify some aircraft wreckage on his property. I originally thought this would turn out to be a USMC F4U Corsair that crashed in the area, but the location did not match up well. The F-84 was a second guess. 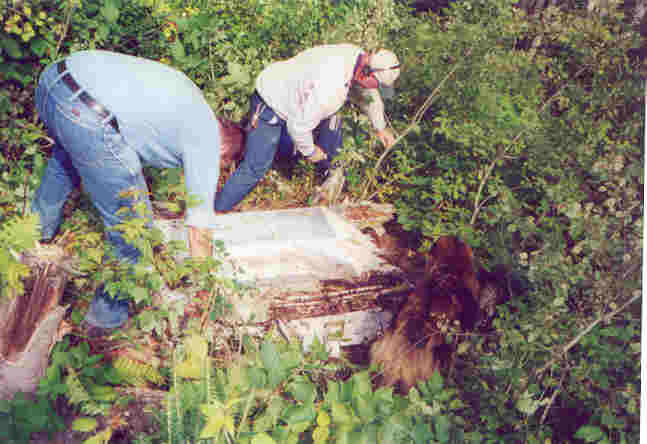 The wreckage turned out to be the wings and canopy that broke from the plane and landed in a wooded area some distance from the documented crash site. Jim Chichetto and Mike Cornett move brush away from the port wing. 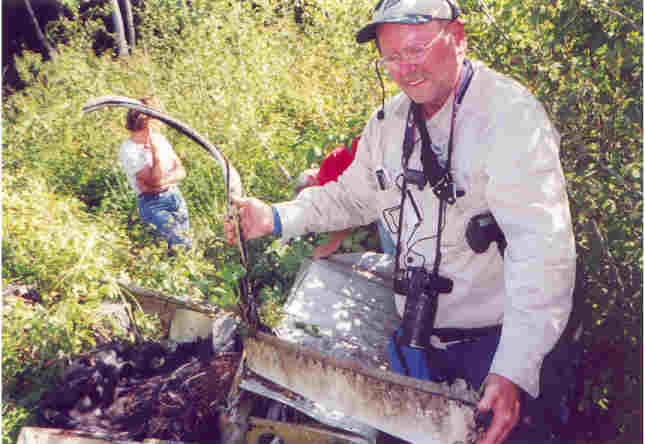 The starboard wing root was found several hundred yards away. Note the rubber fuel tank bladder. 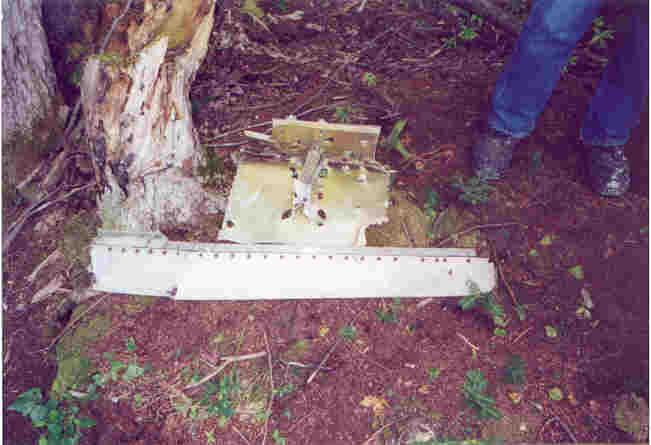 A section of fuselage skin with part of the canopy release mechanism attached. Lt. Rabun told the first area residents on the scene that he remembered pounding on the canopy, the shock of his chute opening and waking up on the ground. He had no recollection of leaving the aircraft or being struck by the tail. Starboard wing. Markings are still visible after 50 years exposure to the elements! Following "crash site courtesy" all wreckage was returned to original positions so that bottom side markings stay preserved!! Mike Cornett holds a section of the canopy.